The World in a Shell is not harmful to the environment. It is a flexible space saving and durable unit that can be re-produced on a large scale and that contains newly developed components which may be used for various other applications. Sustainability finds expression in the use of energy sources, insulation materials, weight saving materials and constructions. A modular interior was designed to enhance the flexibility, functionality and space-efficiency of the working and living area. There may be as many as 90 modules, each serving one or more specific functions; e.g. kitchen facilities, toiletry, water recycling, temperature regulation, multimedia, etc. 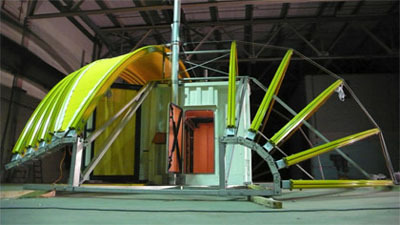 The standardized design of these units makes storage, transportation and reorganization of the modules simple and safe. This system is somewhat analogical to the 'LEGO' system combined with ‘FireWire’ technologies. The unit contains all the basic necessities, including those related to cooking, sleeping, and sanitation. It also has communication and multi-media equipment as well as a set of hardware tools.. 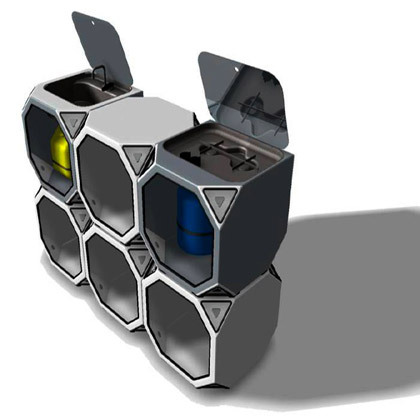 The World in a Shell the worlds most powerful and mobile mini-grid system for its size. The hybrid energy generation of solar and wind energy is crucial to charge the 72 kw/h capacity of the two independent 24 volt energy banks. There are 16 outlets in and outside the container. 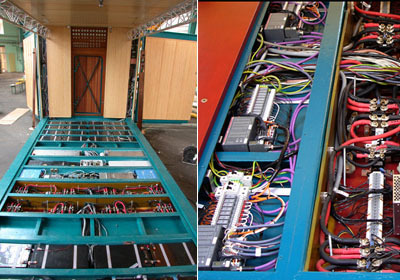 Appliances consume AC or DC current and one single cable is used to connect them to each other..
All the equipment for the mobile laboratory is designed for multipurpose functions and according to ISO norms: changes to external dimensions or structural changes with impact on stability are avoided. The leg devices lift and lower the entire unit with all its components and equipment, enabling self generated loading and offloading from trucks anywhere in the world. Equipped with this system, the unit can be transported by any road-vehicle capable of carrying freight containers and any other mode of transport for that purpose, like trains and ships. This lightweight cover provides insulation in various weather conditions and enhances the aesthetics of the container’s appearance. It also functions as a light absorbent for energy generation, and provides protection from insects and other unwanted animals. The container is capable of operating independently in any climatic condition, dessert to North Pole. 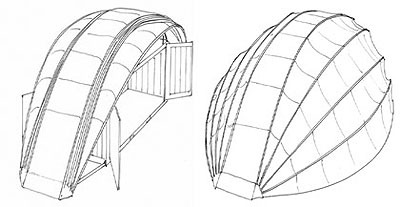 Crucial aspects include the insulation of the walls, the cover tent and the climate control system within the container. The container will be equipped with state of the art computing, multi-media and communication equipment, allowing the user to exchange ideas with people throughout the world. These devices function on low voltage to save energy. 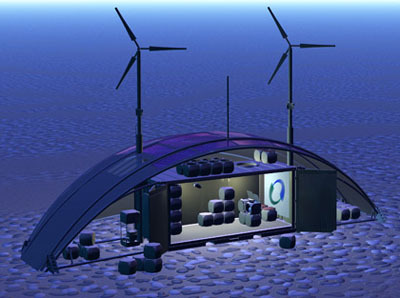 Movie showing 3d rendering of the container.